Happy Friday Luvs! I hope all of you had an amazing week. 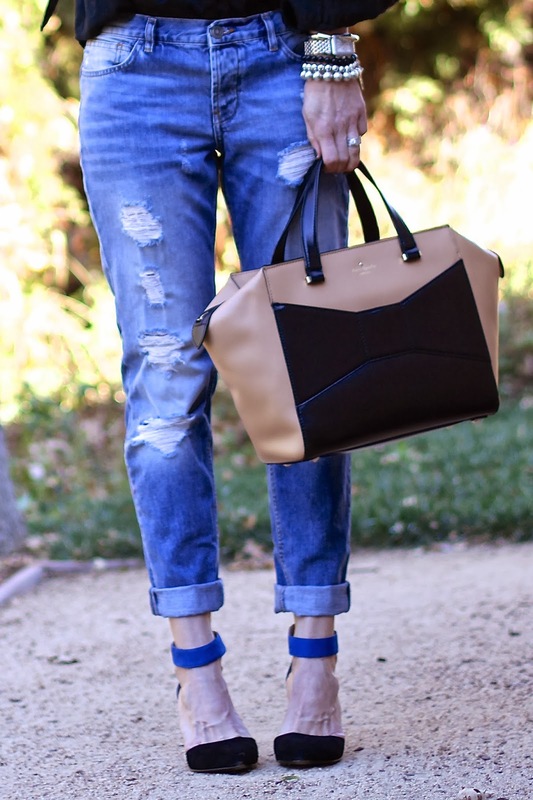 Today I am showing you how I wear one of my favorite styles lately, Boyfriend Jeans! I have finally found THE perfect fitting pair as I like them to sit at my hips and yet have the pockets look nice on the behind. These Brady Slims from ASOS are amazing! And totally on sale right now. So GO!! I paired mine with a classic black button-up and heels to keep this look feminine and chic. You may have seen me on IG here, as this was my passport photo outfit ;] I strolled across these shoes at TJ's a week ago and have to report that they are super comfy with a 3 inch heel. I just love the two tone, color blocking of them as I know they will pair with so much. I feel that I have been attracted to simple, basics lately. Remember that sometimes less is more! This is definitely one of my go to outfits!! Loving this casual/ chic outfit!! Those shoes are amazing!! I love this outfit!! Those boyfriends jeans are awesome. I love how distressed they are. And I love how you styled them with a basic top and an awesome statement necklace. Great outfit! I LOVE this look! Gorgeous! Those shoes, those shoes! I love them so much! And I've been lusting after that Beau - that color combo and the red/pink are my favorite! You look great! I really love those jeans!! Wow, I can't decide what piece I am in love with the most! The purse, the shoes, that necklace! It's all so amazing!! So glad I found you through Friday Fab Link up! I'll for sure be coming back again!! Super chic! I love the color combination and those heels and the handbag are perfect.